Hat fair 2013 – What a scorcher! | First Option Software Ltd.
Hat fair 2013 – What a scorcher! Last year the Hat Fair weekend was, not to put too fine a point on it, a bit of a washout. How different it was this year, with soaring temperatures and wall-to-wall sunshine! For the third year running, First Option Software were involved in Winchester Hat Fair, now in its 39th year. It was two years ago that First Option and Hat Fair organisers launched the Hat Fair mobile app on iOS to help festival visitors, artists and staff to keep right up to date with who was showing where and when. Last year we developed the app further and provided other, non-digital, marketing materials like feather flags, signage, leaflets, programme and more; this year, in close co-operation with the Hat Fair and Theatre Royal team, we reshaped the website, made further improvements to the app and launched it onto the Android platform. In fact it became a major information resource for stewards to help visitors find out what was going on over the weekend. Even though it didn’t rain, things still inevitably changed at the last minute. This year we also had a stand at Oram’s Arbour on the Sunday when we gave away loads of Amazon £10 vouchers through a hi-tech competition which included handing out stickers with NFC (near field communication) capability which could then be scanned by a smartphone app. In blistering heat we had a stream of visitors to the stand to see if they had won a prize, and to be entered into our grand draw to win a Google Nexus7 tablet, which was won by Hat Fair visitor Caroline Feltham-King. 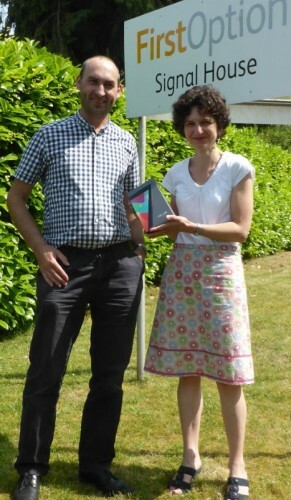 Caroline is pictured here receiving her prize from Matt Clarke, MD of First Option Software. More information about the Hat Fair app can be found on the Hat Fair website and information on the Festival app which is at its core is featured on the Festival app website. Main photo by Adrienne Photography Ltd.